Growing Peppers Mild and HOT! Thin your peaches so they’re 6-8 inches apart, if you haven’t done it already. This will prevent branches from breaking, stress on the health of the tree, and you’ll get better fruit. For more information, see Bulletin #2068, Growing Peaches in Maine. 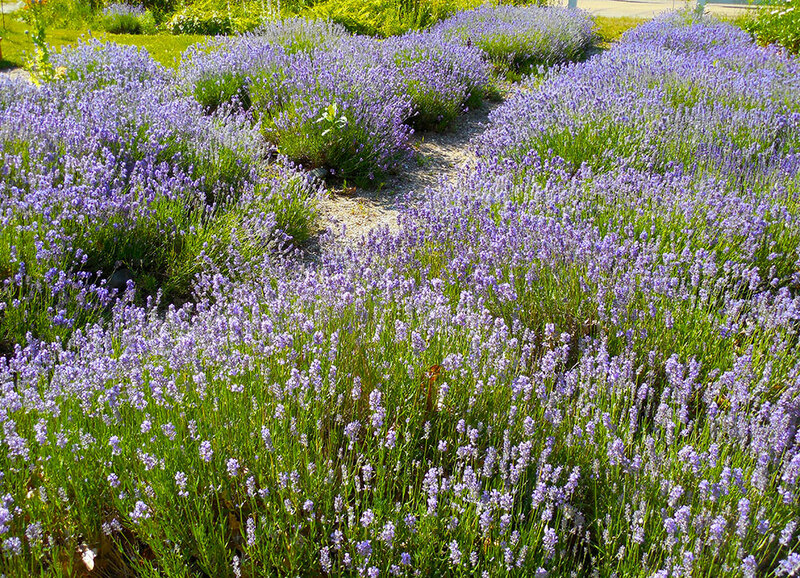 Harvest lavender just as the flowers open. 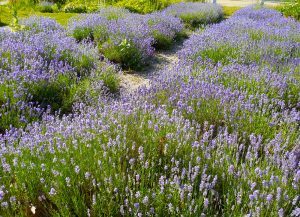 Use this first crop for drying, and the second flush of flowers to enjoy in the August garden. 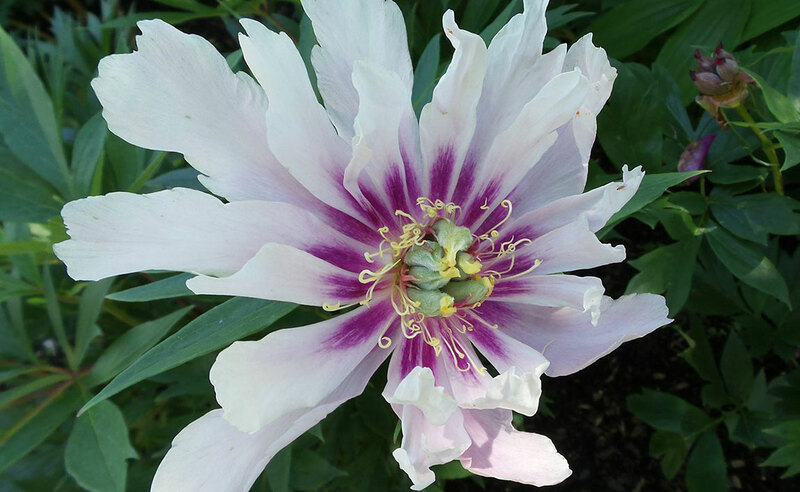 Deadhead plants like peonies, iris, and lilacs. With rhododendrons, be careful not to snip the emerging leaves at the base of the spent flower. Prune and stake your tomato plants before they get away from you. Intercept weeds in your vegetable garden while they’re small. Shallow cultivation with a sharp hoe on a sunny day will do the trick. Do this regularly. Aphids love well-fed plants. Simply take a hose and blast them off. 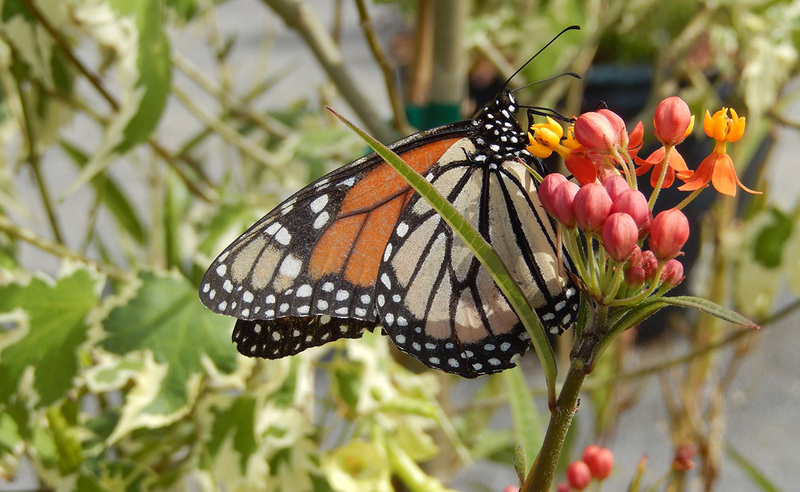 For more information, see Fact Sheet 5039, Sucking Insects That Affect Vegetable Plants. 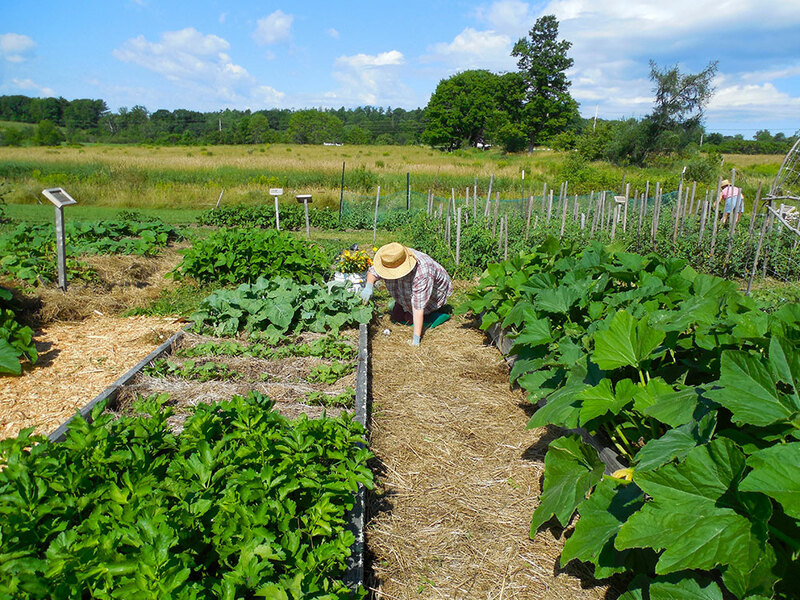 Make permanent paths in your vegetable garden. They won’t need weeding! Use boards, straw, hay, cardboard, or strips of old carpet. Pamper your asparagus patch. Weed it well, and apply compost, manure, or fertilizer. For more information, see Bulletin #2071, Growing Asparagus in Maine. 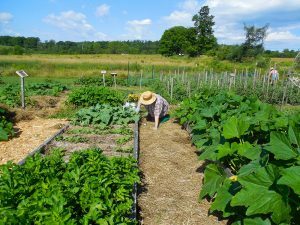 Keep succession planting: Bush beans, summer lettuces, beets, carrots, spinach, turnip, bunching onions, etc. Flip your compost pile. 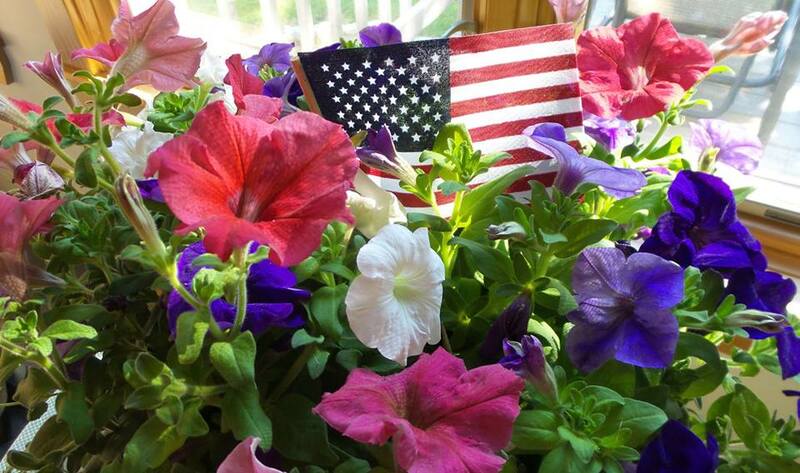 Take the finished material, set it inside (covered) to use on your lawn and gardens as needed. For more information, see Bulletin #1143, Home Composting. 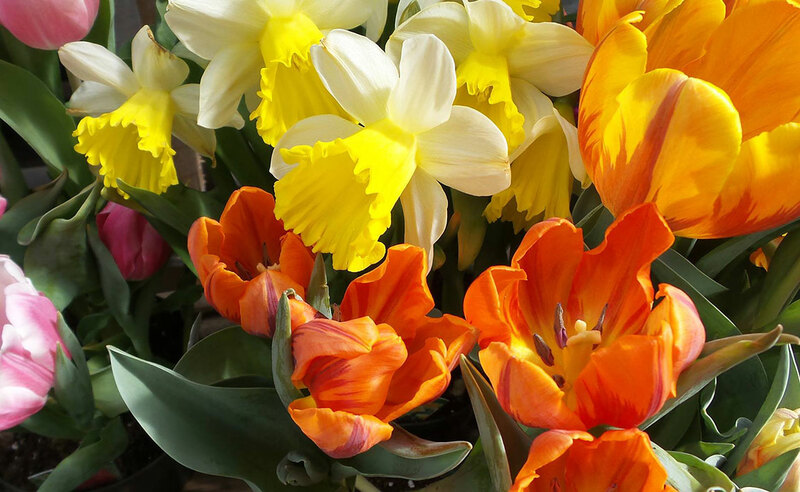 Get new ideas for your home landscape by attending one of many regional garden tours. By Henry Mitchell Restoration by Godot13 – Mitchell, Henry (1876) The State Arms of the Union, Boston: L. Prang & Co., Public Domain. 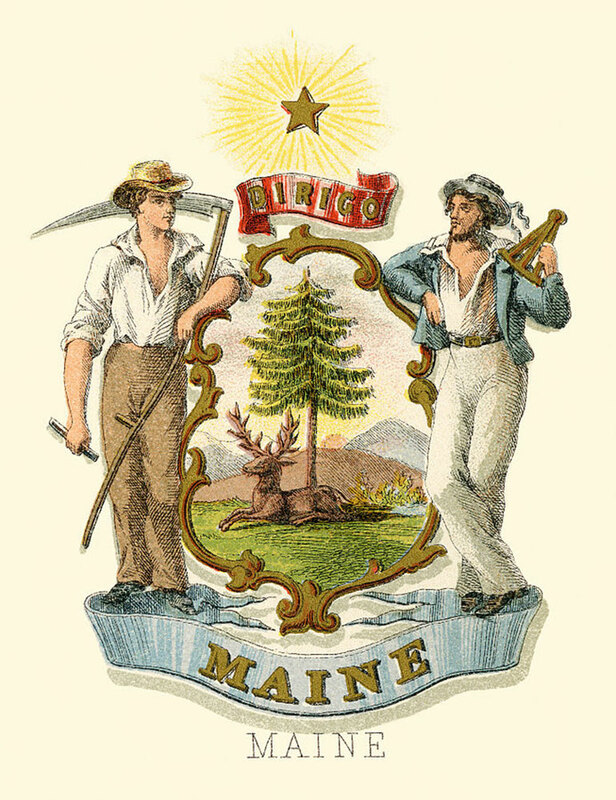 What do the Maine State flower, tree, seal, flag, nickname, quarter, and coat of arms all have in common? If you guessed the Eastern white pine, you’re correct! Pinus strobus is such an iconic symbol in our state that we have officially commemorated it in many of our official designations and it’s not difficult to figure out why. The Eastern white pine is a native species to “The Pine Tree State” and is the tallest conifer in our forests. It is used in many applications, from timber and pulpwood, to ornamental use and erosion and wind control. Historically, the Royal navy and British ship builders prized the old growth pine of Maine and New Hampshire for use as masts on their ships after they had depleted their own supplies, as they were the tallest and straightest trees around. From virtually any location in Maine, you can look out a window and see Eastern white pine in the backyard and on the horizon, but that doesn’t mean it’s any less special as a part of our home landscapes. As habitat and a food source for wildlife, it’s commonly used by squirrels, mice, deer and songbirds. It is also a preferred species for Bald Eagle nesting sites. 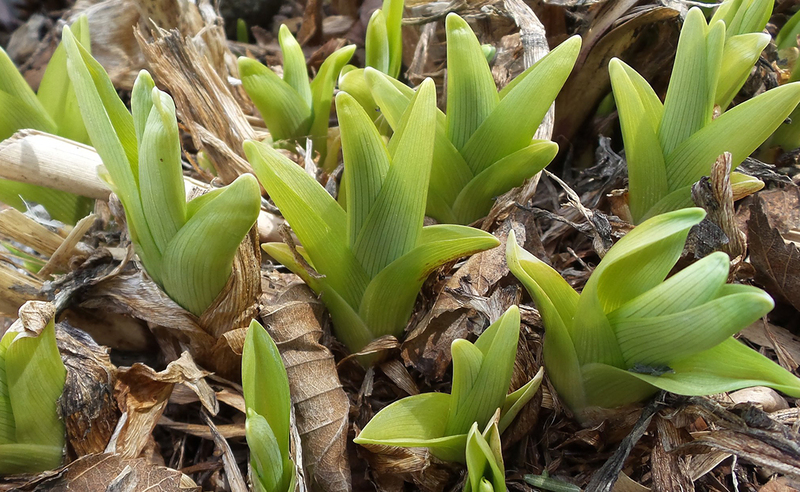 Pine needles are used for mulch on plants with acidic soil requirements and pine cones are used by crafters, florists, and even in medicinal applications. If you are interested in maintaining a healthy yard using native plants, consider an eastern white pine as a specimen tree. 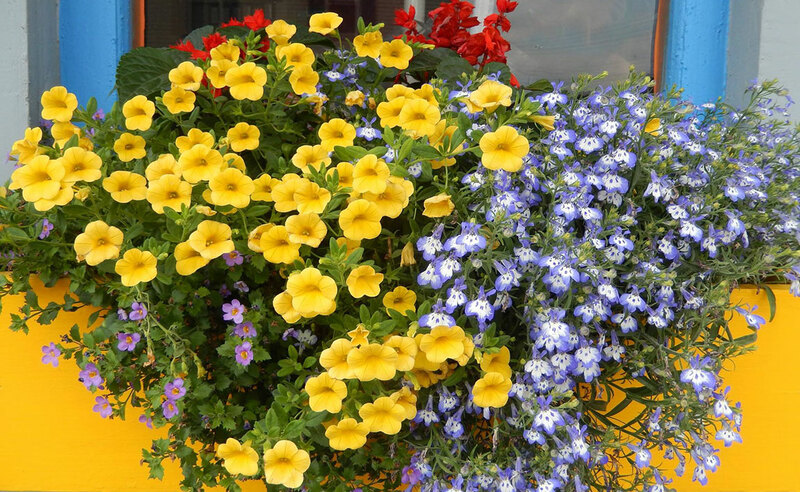 This species does well in a variety of soil types and provides year-round interest and evergreen color. There are some pests and diseases to watch out for, such as the white pine weevil, white pine blister rust and several needle casts. 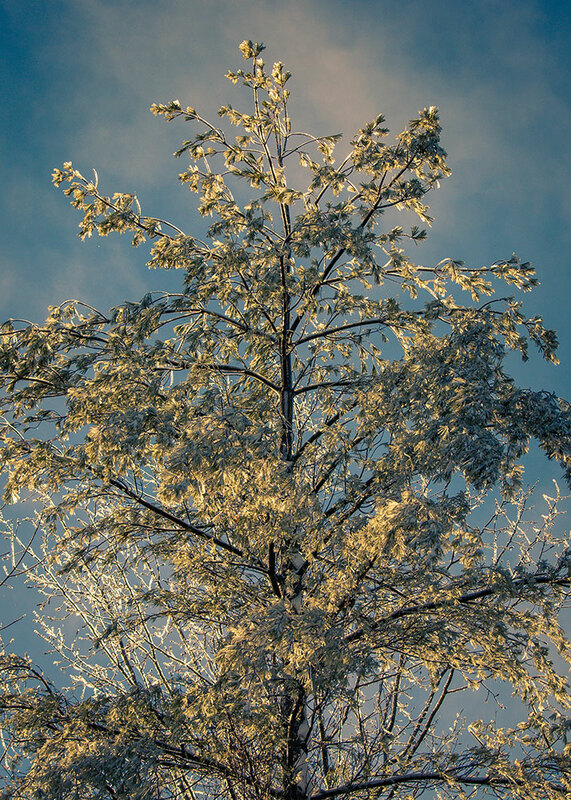 Proper care while the tree is young and being on the lookout for these potential problems can prevent any long-term problems. In July, many gardeners get excited about harvesting fresh summer vegetables and preparing dishes from their garden produce. Many traditional summer dishes include ingredients such as tomatoes and peppers. Though gardeners often argue persuasively about their favorite flavored tomato, peppers present a much wider range of flavors from mild bell peppers to “how hot do you need”? Peppers are generally divided into “sweet” and “hot” varieties based on whether or not they contain the heat producing compound, capsaicin. Peppers are classified into a number of species. 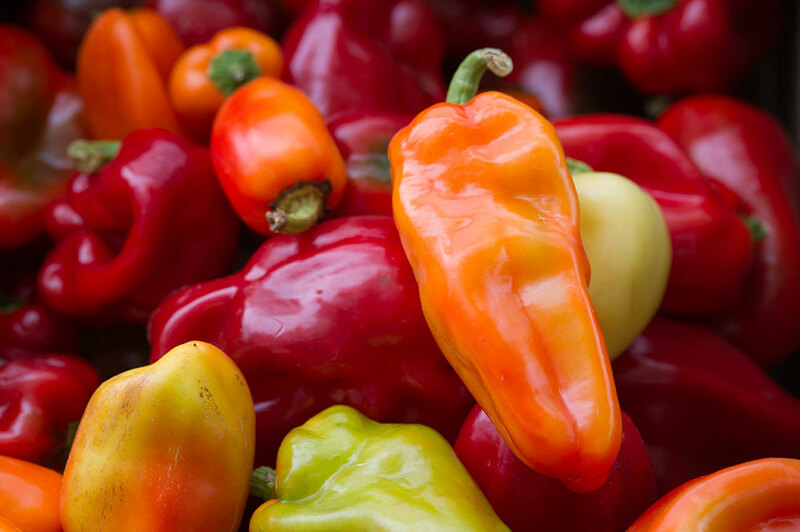 Capsicum annuum includes both hot and mild peppers such as Anaheim, Banana, Cayenne, Jalapeño, Bell, Poblano, Paprika and Cherry. Capsicum chinense includes the Habanero and Scotch bonnet varieties. Capsicum frutescens include the Tobasco peppers. Paprika is a ground spice made from ripened, red and air-dried varieties of Capsicum annuum. The flavors of paprika vary by region and pepper variety combinations. Hot peppers are hot because of compounds called capsaicin and dihydrocapsaicin. These compounds are not soluble in water but only in fats, oils, and alcohol. If you overindulge in hot peppers or condiments made with hot peppers, be sure to drink whole milk to cool the heat instead of water which will only spread the heat. When preparing hot pepper dishes, be sure to use gloves when cutting the peppers to prevent a burning sensation on your fingers and hands that can last for several days. Growing peppers is basically the same for both hot and sweet peppers. Peppers prefer a deep, moderately fertile and well-drained soil. 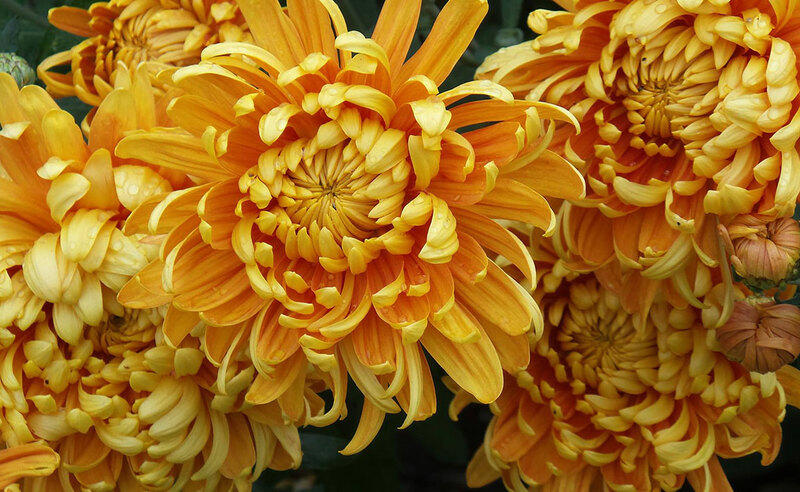 Over fertilization can yield beautiful green plants with few fruits, so fertilize according to soil test results. The heat level of hot peppers can vary and develops as a result of both genetics and the temperature, water level and fertility of the growth environment. Some peppers may require staking especially when carrying a heavy fruit load and when located in a high wind area. Peppers can be picked and used when green or allowed to fully ripen on the plant and preserved by drying or freezing. Peppers picked for fresh eating should be cooled as soon as possible after harvest and stored above 50º F. For more information on preserving peppers, see UMaine Cooperative Extension Bulletin #4043 Let’s Preserve Peppers. For a great salsa recipe go to Salsa. Summer is the time of year we all get outside and enjoy the warm sunny weather. 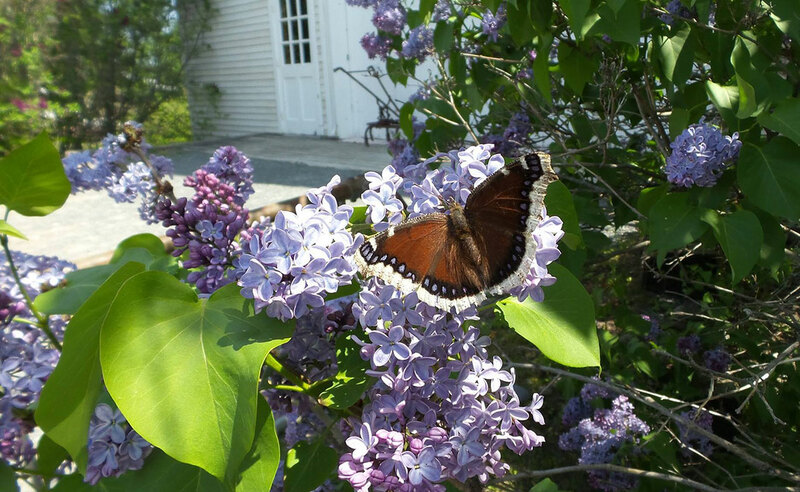 As the gardening season progresses we notice the increased activity of the many pollinators around us — bumble bees, hummingbirds, butterflies, and of course, honey bees. With this comes the curiosity on just how these pollinators do their job and how they live their lives. To help answer some of these questions each year, members of the Maine State Beekeepers Association give talks and demonstrations, collect swarms, and just generally volunteer in all kinds of ways to help people understand the important role pollinators play in making our flower and vegetable gardens more beautiful and abundant. The Cumberland County Beekeepers Association presents at the Gray Wildlife Park each year. They bring an observation hive with live bees along with hive equipment, beekeeping tools, smokers and veils. It is a fun day for families. Adults and children alike can watch the bees busily working and learn about the life of the honey bee. Kids are encouraged to dress up in beekeeping attire and have their pictures taken. A view of the Tidewater Apiary. Photo by Keith Kettlehut. If you miss the CCBA beekeepers at the Wildlife Park, you may be able to catch them at the Tidewater Farm in Falmouth where the club has an apiary on Cooperative Extension land. Open hive events and impromptu demonstrations are conducted throughout the season. If you just happen to be walking the Portland Trails when the keeper of the apiary, Keith Kettlehut, is present you are welcome to stop, observe, and ask questions. And, if you are feeling brave, extra veils are usually available so you can get an up close tour of the bees working inside their hives. The Sagadahoc Beekeepers offer a “Honey Bee Night” once a year at Curtis Memorial Library in Brunswick that includes a short film, a panel Q & A, a honey tasting, and a sampling of honey-sweetened beverages by Green Bee Soda for curious members of the community. During the library’s “Eat Our Yards” lecture series, club member Mike McNally presented an introduction to beekeeping talk. The Western Maine Beekeepers presented at the Fryeburg Home and Garden Show this past May. Their talk “Helping the Honey Bees and Other Pollinators” was given by Carol Cottrill and emphasized the important role honey bees and native pollinators play in Maine agriculture. So much of the food we eat depends on pollination by some type of bee. 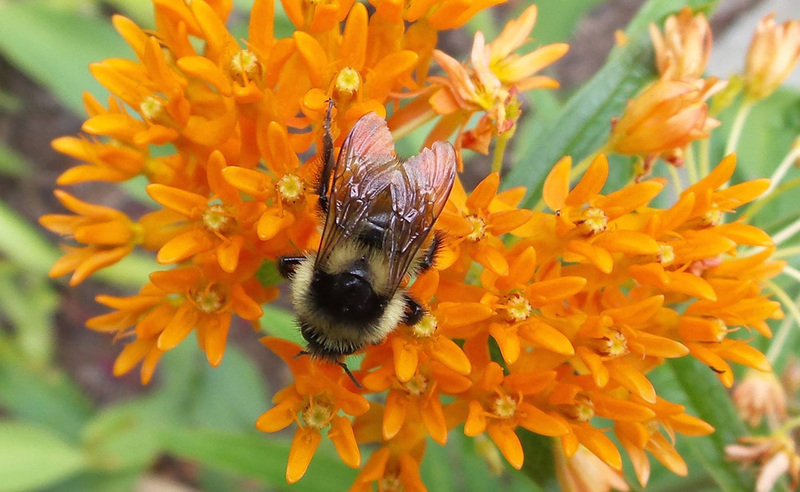 Homeowners and gardeners learned steps they can take to protect and promote honey bees as well as native pollinators of which there are over 270 different species in Maine. A Western Maine Beekeepers booth display at the fair. 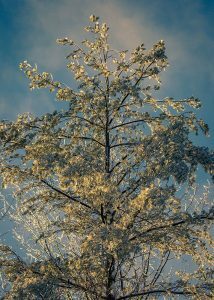 Photo by Carol Cottrill, Past President of Western Maine Beekeepers (WMBA). 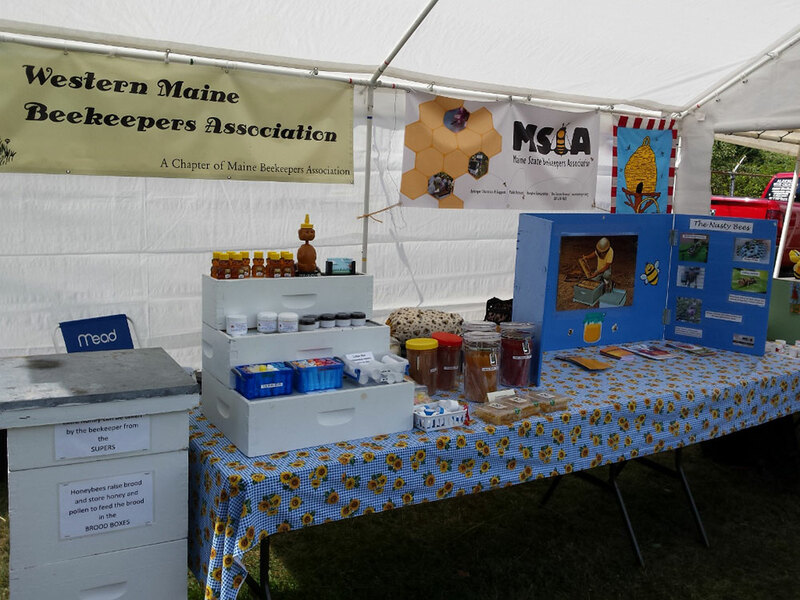 You will also find the Western Maine Beekeepers at the Fryeburg and Franklin County Fairs each fall tending an educational booth to teach adults and local school children about Maine agriculture. To assist at the booth each year is either the American Honey Queen or Honey Princess. Fairgoers can peer into an observation hive, learn how to extract honey from the comb, and taste honey samples. Those who are interested in learning more about honey bees are directed to educational opportunities available through the Maine State Beekeepers Association. Nearby in Waterford, the Oxford Honey Bee Club has an educational booth at the Waterford World’s Fair each summer. Club members join the Oxford County Soil and Water Conservation folks to provide activities with local kids at the fair to teach about the value of honey bees to Maine agriculture. 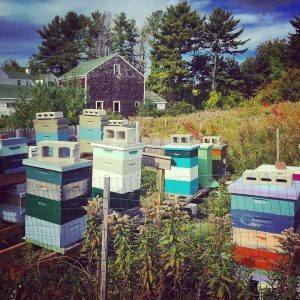 Across the state in mid-coast Maine, the Knox-Lincoln County Beekeepers reach out to the community through a number of different venues such as the Knox-Lincoln Soil & Water Conservation Fair where they have been educating the public about honey bees for the past 17 years. At this event, students from Knox and Lincoln County schools come for a day of exploring conservation topics, environmental issues, live animals and farming, music and fun. Even-numbered years are reserved for early elementary students and odd-numbered years are for middle school students. If you would like to attend, mark your calendar for September 28, 2017, 9 AM – 1:30 PM at the Union Fairgrounds. Many of our chapter clubs reach out to elementary schools to teach about honey bees and pollinators. The Androscoggin Beekeepers Club in particular visits many classrooms during the school year. Their presentations delight and inform the children while also challenging them to think about what our world would be like without pollinators. The honey samples are a big hit as are the beekeeping tools and equipment. The children take turns trying on a beekeeper’s suit. The ABC is setting up a new hive this year at the Whiting Farm, a non-profit in Auburn. This hive will support pollination on the farm and be used for teaching purposes. Both club members and others — especially those who may want to become a beekeeper — are welcome to learn from the farm’s new edition. The Penobscot County Beekeepers Association developed a unique hands-on educational program for students at Hampden Academy who want to learn about honey bees. Led by Peter Cowin, the PCBA established an apiary on campus and organized a beekeeping club for students and staff. Beekeeping husbandry is taught and students are instructed how to install bees, conduct inspections, harvest honey, and make products from honey and beeswax. The program, now in its third year, helps students learn about running a small business by selling the honey and hive products. Profits are reinvested in the program. The club has grown to 24 student members operating three hives. At least two of the club’s high school graduates have gone on to start beekeeping clubs at their universities. These are just a few of the programs and events our member volunteers conduct throughout the year. We welcome the opportunity to speak at local events, garden clubs, or schools. 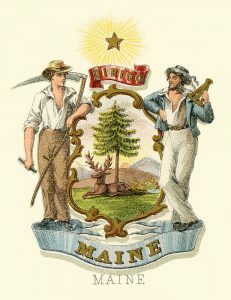 Please visit our website, mainebeekeepers.org, to find contact information for a chapter club near you. You may also want to follow the MSBA on Facebook for updates, future activities, and interesting information about honey bees. Enjoy the rest of your summer and, remember, when you see any of the pollinators busy at work in your gardens or fields, it is because of them that our environment and lives are so bountiful. July brings the first harvest of green beans ready for fresh eating, pickling, and freezing. Freezing green beans is a great way to preserve them for year-round use and results in a product that is closer to fresh than canning does. For best results, the USDA recommends blanching green beans before freezing. Blanching kills enzymes inside the vegetables that can cause a loss of color, texture, and flavor over time. The trick to avoiding mushy green beans is to stop the cooking process before they become overcooked. Use an ice water bath to shock green beans after blanching for a higher-quality frozen product. Freeze beans in freezer-grade plastic containers and use within 6 to 8 months for best results. To freeze green beans, select beans at when they are young and tender — overgrown beans can be tough. Wash beans and remove any stem and leaf bits. Cut into pieces that are 2 to 4 inches in length. Bring one gallon of water to a rapid boil in a blanching pot (a large stockpot with a blanching basket insert). Add one pound of prepared green beans and boil for 3 minutes. Avoid blanching too many beans at once or the water will take too long to return to a boil and result in overcooked beans. After blanching is complete, remove the blanching basket and empty beans into a large bowl full of ice water. Adding a colander to the ice water will aid in easy draining after vegetables have cooled. Chill vegetables for 3 minutes, then remove and drain. Dry vegetables in a salad spinner or with clean dish towels. Pack into appropriate containers and label and date. Store in freezer, set at 32 degrees F or below. For a demonstration of how to freeze green beans, watch How to Freeze Green Beans by UMaine Extension Educator Kathy Savoie. For more information on freezing, visit the National Center for Home Food Preservation’s General Information on Freezing Vegetables and for more information on how to best preserve your harvest, consider a taking a UMaine Extension hands-on workshop in your area.